The current national offers of climate action submitted to the United Nations Framework Convention on Climate Change (UNFCCC) would reduce projected warming by approximately 1°C, according to a new analysis released today from Climate Interactive and MIT Sloan. A Paris agreement based on these offers would put the world on track for a global temperature increase of 3.5°C (6.3°F), with a range of uncertainty from 2.1 to 4.6°C (3.7 to 8.4°F), down from the 4.5°C (8.1°F) of warming above pre-industrial levels if nations continue on the business-as-usual track. Climate Interactive’s Climate Scoreboard analysis, produced in partnership with the Massachusetts Institute of Technology Sloan School of Management (MIT Sloan), shows that the intended nationally determined contributions (INDCs) put forward in advance of the UN climate talks this December make a sizeable contribution towards curbing global emissions and limiting warming. However, the offers need to be paired with further action if warming is to be kept below the 2°C target, avoiding the worst impacts of catastrophic climate change. These findings are particularly relevant to the consideration of the type of provisions that could be included in the durable global climate agreement that world leaders are aiming to establish in Paris this December. For example, the Paris agreement could establish a process for continuing and deepening emissions reductions after 2025 by including a regular review cycle that pushes countries to continually strengthen their targets in the years to come. 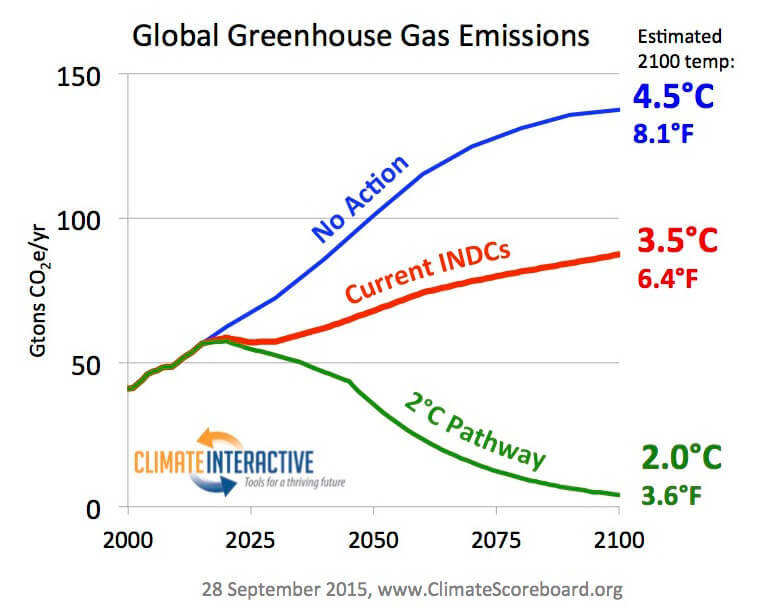 Simulations included in the analysis also show how the world can feasibly obtain emission levels that would curb warming below the 2˚C goal. First used at the Copenhagen climate talks in 2009, the updated online tool calculates the cumulative benefits of the ongoing negotiations in real time, allowing anyone to track the outcome. 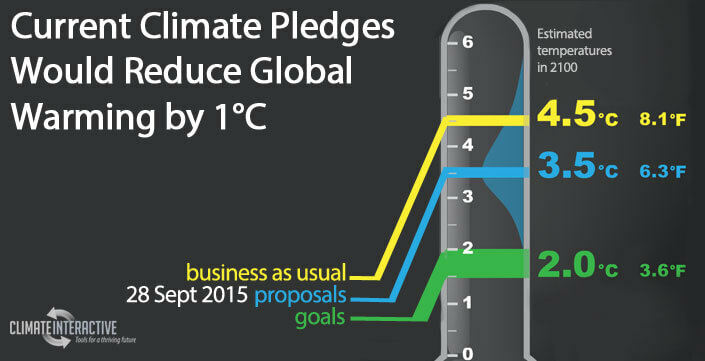 The Climate Scoreboard can be shared across online social media and embedded in blogs and websites where it will automatically update as Climate Interactive includes new or updated pledges, formally known as Intended Nationally Determined Contributions (INDCs). The Scoreboard is based on the C-ROADS (Climate Rapid Overview and Decision Support) computer simulation, which is calibrated to the Intergovernmental Panel on Climate Change’s (IPCC) Fifth Assessment Report results. C-ROADS emerged from research at MIT Sloan and allows users to select real and potential mitigation proposals from around the world. It then simulates these emissions’ impacts on greenhouse gas concentrations, temperature change, per-capita emissions, cumulative emissions, sea-level rise, and other indicators. C-ROADS is downloadable and available for public use. Images of the Climate Scoreboard can be viewed and downloaded at www.climateinteractive.org/tools/scoreboard/. Climate Interactive is also hosting an informational webinar on Wednesday, September 30th at 12 pm EDT. Please RSVP for the webinar here: https://attendee.gotowebinar.com/rt/2467644211219127298. To arrange an interview with one of the project leads please contact: Paige Knappenberger, pknappenberger@climatenexus.org, (602) 549-0344 and Jennifer Haskell, Climate Interactive, jhaskell@climateinteractive.org, (703) 231-1835. For further information, please visit: http://climateinteractive.org. Inquires at info@climateinteractive.org. And follow us on twitter @climateinteract.